LAKELAND, Fla. – Florida Polytechnic University starts its third academic year on Monday, August 22, welcoming more than 1,300 students – a record high enrollment for Florida’s newest university and more than double the university’s 2014 opening enrollment. The incoming class at Florida Poly has an average GPA of 3.8 and an average SAT score of 1734. Florida Poly has a total of 63 full-time faculty scheduled to teach this fall and is expecting a faculty-to-student ratio of 18 to 1. During this past year, the university hired 47 full-time faculty members with industry and academic experience to accommodate its growing student population. In 2015, the university announced its plans to hire more than 70 new faculty members by 2017. Florida Poly will celebrate the start of its academic year with Purple Fire Week, a spirit week that begins on the first day of class and includes daily activities and festivities that immerse students in college life. The university was awarded “Candidacy for Accreditation” status by the Southern Association of Colleges and Schools Commission on Colleges (SACSCOC). More than 60 students secured internships with some of the largest and most advanced high-tech companies nationwide. Construction began on a second on-campus residence hall which opened this week, more than doubling the school’s on-campus housing capacity. The university signed international partnership agreements with universities and organizations in Morocco and Brazil, sparking opportunities for study abroad and faculty exchange programs. Also during this past year, the Florida Polytechnic University Foundation raised more than $2 million for scholarships and university initiatives. The Foundation’s fundraising efforts support the university’s innovative mission and will allow full-time students attending Florida Poly in the 2016-17 academic year to receive funds based on both merit and need. Most scholarships cover the full cost of tuition for each financial aid year, for four years. 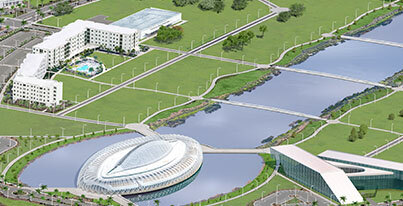 This fall, design work is scheduled to get underway for Florida Poly’s new Applied Research Center. The Florida Legislature approved $5 million during the last legislative session to fund the planning and architectural work on the center, and the university is contributing a matching $5 million toward that effort.